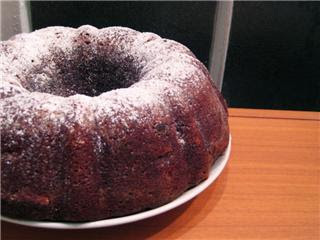 Very impressive when cooked in a decorative bundt pan! Grease and flour a 10-inch bundt or tube pan. Whip margerine until fluffy. Add sugar and whip. add 1/2 cup of soymilk, slowly. If batter is too dry, slowly add a bit more milk. Fold in apples and choc. bits. As "Kitchen Buddha" at the local Unity (spiritual center), I will have to give this one a try on Birthday Sunday ... since my birthday is in November, I have been told that I am not allowed to do the cake & that someone else will do/bring the cake ... so, I won't be able to give you attendee feedback until after the first Sunday in December, but I will at that time. I'm assuming that's bittersweet chocolate chips? This was really tasty--kind of like a big apple brownie! Soooo tasty! I've always wondered how to make chocolate molten cake vegan, and I think this is it (minus the apple chunks and chocolate bits)! We don't have a bundt cake pan, so I just did it in my 9x13 pan. I quartered this recipe and made it in cupcake liners (I didn't want a whole cake!) and it was pretty tasty. I don't think it even needed the chocolate "bitties," and I accidentally dumped more allspice in than recommended (which I think was for the best). The tops got all crispy; I think this would also make good cookies.